Never thought it would really happen, but now it is: the trello board is getting empty. That means Path of Adventure is getting close to release! I'm guessing this will be the last update before the final release. 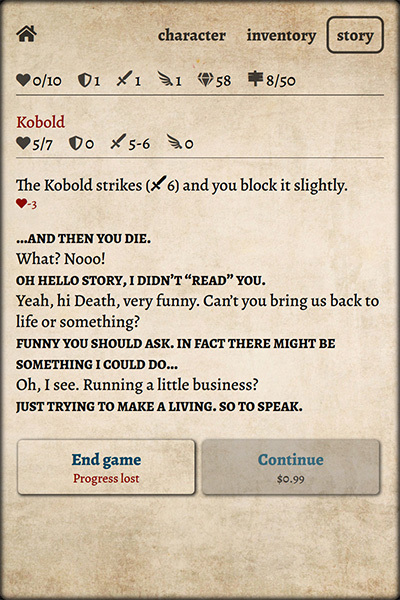 I thought a text-based game really deserves a better story than what was there. So I expanded the backstory a bit and integrated it more into the game. Certain events, like the boss fights, have a reason for why they happen and push the story forward. There's also a little side quest that involves collecting certain items granting a great reward at the end. With the basics added in the previous update, I've added the remaining parts needed to play the game with different characters. 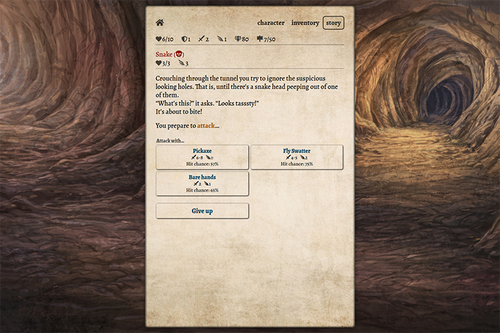 Characters bring their own starting stats and a unique item: a magical ring that grants a great power. Upon completing the game the next character is unlocked. This way I hope the game offers greater replayability. The prices are really just an idea and I'm keen to hear what people think of them. So please share your thoughts! Thanks for reading and hope you enjoy the game. If you have a thought about any of the updates, feel free to leave a message. Does the continue cost $0.99 every death? Or, is it a one time payment that unlocks the option to continue? I don't like the continue idea, mainly because I think perma-death games should stay that way . But, I do like the idea of $1.99 per character. Maybe you could add certain perma-buffs/items that could be available at the beginning for a cost (e.g. $1.99 allows you to also start with a random spell every adventure, or $1.99 unlocks such and such an item to begin with every adventure. I have a lot of ideas from playing a lot of different rpg's, but I don't know if you want to hear a bunch of them. The difficulty right now doesn't bother me. I think more item drops from monsters or finds would be better than lowering the difficulty. I don't think people will be willing to pay $0.99 for every continue, especially if the die twice in one run (that would frustrate me). But, permanent unlocks are definitely a plus like: starting at level two, unlocking a specific spell, item, or weapon that could be used at the beginning of each run. There's also the possibility of leaving the characters items behind from the last run as a possible loot, like in Dark Souls games. There are two games that I have seen apply the Fallout percentages aspect (i.e. accuracy and damage differing against upper, mid, lower or specific body parts). I've always found that fascinating. I don't know if you've played Buriedbournes, but I think a lot of what that game has can be learned from for these types of Roguelite RPG's. I mainly don't play that game because of the crude graphics; which your game has eliminated. Since you're wrapping up the game for the Android release, it makes my suggestions a bit difficult because many could require a bit or coding (which I know nothing about) or change that you may not want. It depends if you view this game as a living model that you will continue to update and grow, or if you just plan to put it out there and let it be. Also, I did notice some grammar and clarity errors in the writing. If you are interested, I would be willing to go over your text to clean it up as I am starting a freelance proofreading/editing portfolio, and I have an English degree. Either way, I thought I'd make the offer. Thanks for getting back to me. I don't know about the prices (not an opinion, I mean I literally don't know enough about monetization to know if they're good or not) BUT you should probably make it clear on the continue / screen what happens if you continue!! Do you get resurrected back to full life?? Does the current even restart?? Do you get a new random event?? I'm looking forward to playing this new release! !